Deck Beam on Foredeck: A view of a a deck beam on the fore deck, just at the beginning of the deckhouse. This project will replace ten deck beams and will replace the ends of others. 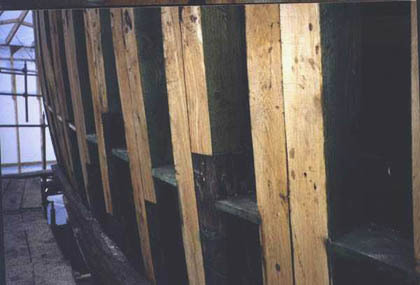 The filler pieces are notched into the deck beam and run longitudinally, providing strength, stability, and strength of the fore deck. Towards the edge of the deck, the shelf structure of longitudinal timbers is visible. The shelf provides longitudinal strength, resists compression, and is the seat for the deck beam ends. The clamp timber can be seen protruding slightly higher than the other shelf timbers. The deck beams are notched to lock over the clamp. The deck beam structure is built of recycled yellow pine timbers salvaged from old mills and barns. It is strong and seasoned, and is not beginning its second career and century of service. 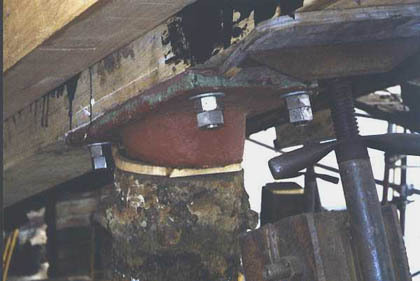 Rudder Bearing and Horn Timber: At the stern, the horn timber rises up and aft from the stern post, providing the centerline strength for the stern of the tug. 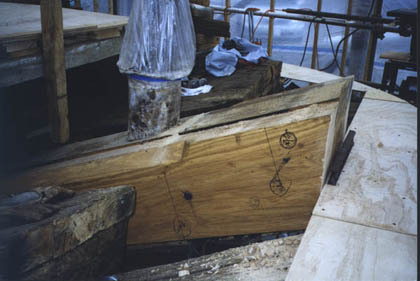 Here is a view of the bottom of the horn timber, where the rudder shaft intersects with the horn timber through the rudder bearing. The steel forging seen here is the overhauled lower rudder bearing, complete with Monel nuts that have been cleaned. In the upper left corner is a portion of the tail feather boards that are located on the sides of the horn timber. The tail feather locks the horn timber in position, passing the vertical stern post on both sides. It also provides the landing for all framing aft. The planking will end at the horn timber as will the internal ceiling planking. Apron and Stem Pieces: Here at the vertical bow of the Luna are the stem timber (right) and higher apron timber (left) which are sistered together with a series of countersunk bolts, creating a massive white oak complex that is 26 inches deep and 12 inches wide. The apron is higher because its top portion will be fashioned into a riding bitt for lines. The vertical notch carved into the side of the stem timber will accommodate the ends of hull planking. The tar between the timbers stops rot. 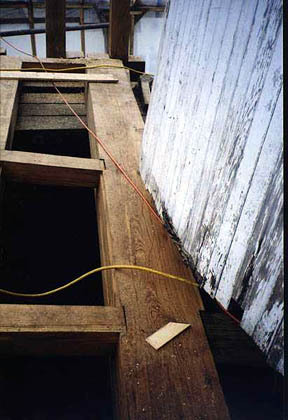 Framing with Salt Stops: Here is completed framing, with the horizontal salt stop "shelves" in the void spaces. 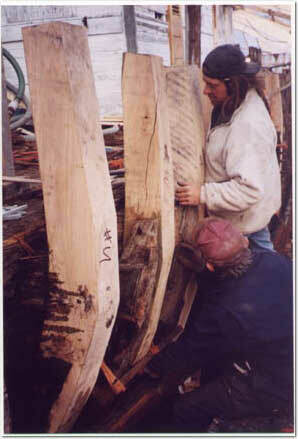 The frames are double sawn from 6-inch thick timbers that reduce in depth from 12 to 8 inches at the main deck. They are bolted together, and coated with linseed oil to slow the drying process. The salt stops will form the base of salt that will fill each frame spaced above them. Horn Timber Side View: Here is the end of the horn timber, showing the rudder stock and bearing assembly intersecting with it. The thin plywood pattern for the massive 14-inch rim timber of the eliptical stern can be seen resting on the aft end of the horn timber and tail feather boards outboard of them. The pattern is checked and adjusted to guide the critical cutting of the rim timber.